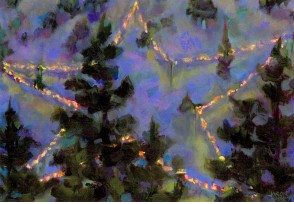 The lighted star on Flagstaff is a familiar symbol in Boulder. First turned on as a Christmas decoration in December 1947, the star survived several controversies to become what it is today—part of the area’s history and culture. In April 1948, the Boulder Chamber of Commerce converted the star into an Easter cross. Then, for two decades, the long string of lights alternated between the two symbols. In 1955, 1956, and 1960, someone, or some group, painted the bulbs red, speculated to have been part of a Communist conspiracy. In 1969, the star/cross was changed again—this time into a gigantic peace sign. Finally, some Boulder residents had had enough. They filed a complaint with the Boulder Human Relations Commission on the grounds that the star and the cross (both considered Christian symbols and located on city park property) violated the U.S. Constitution in its separation of church and state. Although the lights had sparked a controversy, they stayed on. The debate resurfaced a year later. In 1970, the same group brought to the Boulder City Council a resolution banning all lighted displays on Flagstaff Mountain. In 1980, the star served yet another purpose. It was left on month after month as a reminder of the Americans held hostage in Iran. This ongoing use of electricity, however, upset environmentalists who removed the bulbs, chopped down the wires, and publicly announced that the man-made object disturbed wildlife and wasted energy. Even so, the majority of Boulder’s residents still wanted their star, and, once again, they rallied to its defense. It has survived the test of time and appears to be here to stay.